No tv antenna removal job is too big for Barnes TV Antenna/Satellite Removal Service. 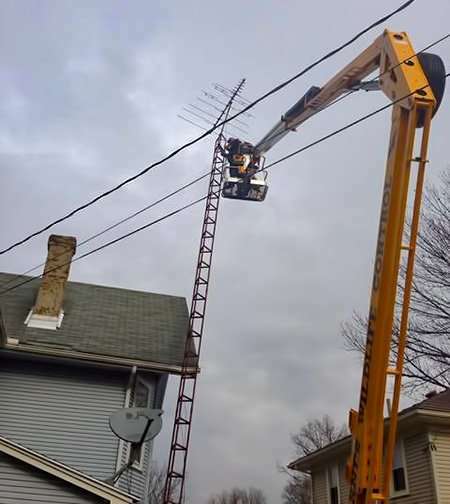 Here, we are taking down an antenna in Troy, Ohio. Another job well-done. Regardless your antenna’s size, you need to have it removed by a knowledgeable tv antenna removal service. That’s what we do best! 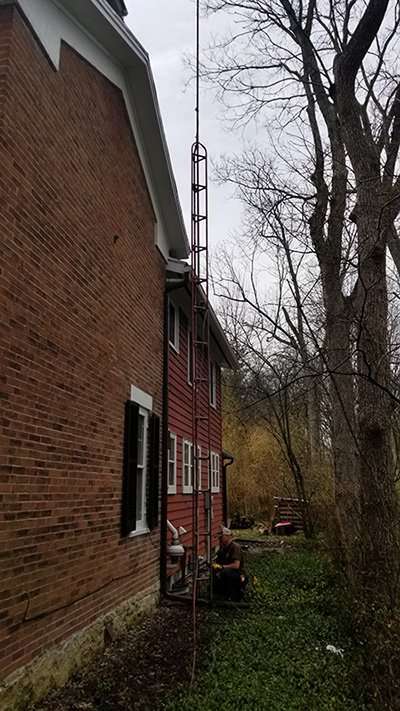 You need a roofer who has the ability to deal with the shifting weight of the antenna. As the cables are removed antennas become unstable and accidents can occur. Make sure you find a service with good insurance. You can rest easy with the Fully Insured And Bonded Barnes Wildlife Controls TV Antenna Removal Service. Also, note that a tv antenna removal service must understand that the anchor points need to be removed and then covered. And, if you have a flat roof then absolutely make sure you remove anchor points and cover them. For example, flat roofs have a high probability of water leakage with uncovered anchor points. Also, our trained roofers check for and repair any holes in the roof after the guyline pins are removed. Assuming you don’t use the antenna, you may recoop expenses if you sell the metal to a scrap dealer. Otherwise, we will take your antenna away as part of our fee. 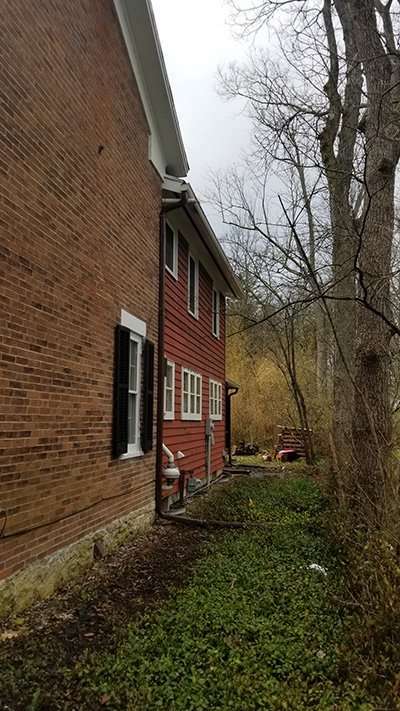 As you know, more homes are switching to cable television, so, there are a number of unused antennas that create eyesores on home’s exterior. There are several things to keep in mind when removing your antenna. Having that antenna properly disposed of if one of those considerations. At Barnes Wildlife Control’s TV Antenna Removal And Disposal, our service fee includes environmentally friendly local recycling and disposal costs. Do You Really Want To Get Up On Your Roof And Remove Your Antenna? Are you comfortable with the idea of going up on the roof given its height and steepness of the pitch? Second, beware that antennas are somewhat top-heavy, so you don’t want to do it on a windy day. Also, you must watch out for power lines in the area. You don’t want to hit the power lines with the antenna while removing it. Furthermore, if the antenna has been up there for a while, the fittings are probably rusted. So, you need a good set of wrenches, pliers, some WD40, and in all probability a hacksaw to cut bolts. Also, a second set of hands is always useful when taking down an antenna from a roof. Finally, you have to plan on how you’re going to get it off the roof. Are you going to lower it with a rope or fold it and take it in a window? So, are you ready to make all these decisions? Hey, just make it easy on yourself. And most important, don’t take risks that may injure you or your loved ones. Call The Antenna Removal Experts At (937)-340-1867. If you’re not going to use that antennae or dish then get rid of that eye-sore on your home! 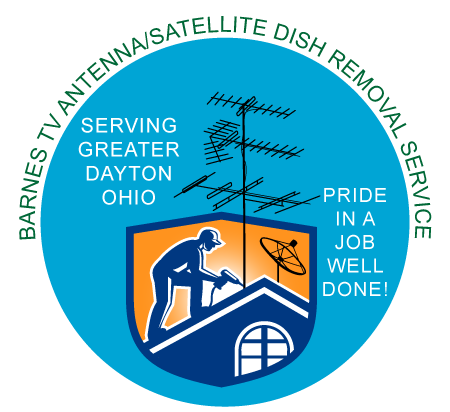 Barnes removes unwanted satellite dishes and antennas in the Greater Dayton Ohio Area with a 100% satisfaction guarantee. We improve the appearance and safety of your home or business by removing all shapes, sizes, and ages of satellite dishes and antennas. Satellite dishes become outdated once you install them. The satellite TV providers have no use for the old dishes and won’t remove them for you. Satellite TV Providers realize it not cost effective to go to your home, remove the satellite dish, and dispose of it. In fact it costs less for them to make and install a new satellite dish. We remove and recycle all manner of satellite dish receivers and antennas from residential and commercial properties. Our removal services include standard satellite dishes, large satellite dishes and TV antennas. Our pricing is the best in the industry and our work exceeds all expectations. Also, don’t forget, our fees include disposal of antennas and satellite dishes. Barnes Wildlife Control takes pride in a job well-done and your satisfaction is 100% guaranteed. Licensed, bonded, and insured, Barnes Wildlife Control removes all materials from your property. We recycle and dispose these materials as required by law. Look No Further. Get Started Today With Barnes Wildlife Control’s TV Antenna Removal Service For Greater Dayton Ohio.